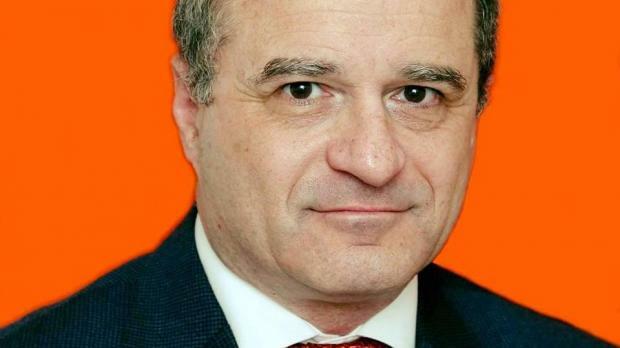 The Democratic Party's Anthony Buttigieg has announced his resignation as deputy leader, in protest over comments by party leader Marlene Farrugia. Dr Buttigieg said on Facebook that he had joined the PD to create a new way in politics. However, Dr Farrugia's statement that she did not exclude contesting for the PN leadership and merging the PD with the PN "goes completely opposite to my hopes, aspirations and philosophy," he wrote. "I cannot continue as Deputy Leader on a mandate tbat no longer seems to hold weight," he added. 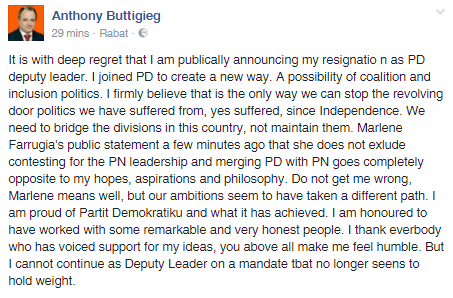 In a subsequent post, Dr Buttigieg clarified that while he was quitting as deputy leader, he would remain a PD member, adding that following the party's electoral defeat, "the executive should resign, an extraordinary general meeting convened, the old officials reconfirmed or new ones elected." See his initial post below.